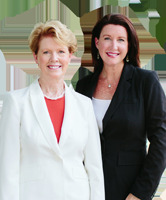 Mary Ellen Peters & Company is a small family centered real estate team in the Tennessee Valley. Having moved many times themselves they know what is like for families to relocate to a new area. Their goal is help the whole family so that they too will one day enjoy calling the Huntsville area “home”. They are top producing real estate professionals and look forward to sharing their expertise with you. To provide outstanding real estate service with honesty, integrity and professionalism. Exceeding our client's expectations is our highest priority. We want to offer you the very best in client service. Let us help you.